Bruxing or teeth grinding can cause serious problems, not only for patients, but for the people that live with them as well. For the patient, their teeth are worn down by frequent teeth grinding and clenching, and in some cases the on-going friction and pressure can cause TMJ (headaches). As for the family members, the grinding noise can keep them from having restful sleep, possibly making them irritable and sleep deprived. Usually teeth grinding is caused by either stress and/or the bite. Our expertise is in treating the bite. We first assess your bite and will determine whether a minor correction can be made. If your teeth grinding is severe and you have symptoms such as sore facial muscles, popping of your jaw joints, persistent headaches and worn down teeth, then we would strongly recommend a night guard. The night guards are essentially a thin, clear layer of plastic that separates your teeth while you sleep, and relieves grinding and clenching pressure. Not only does it serves to protect your enamel, and stops your teeth from becoming loose, it also protects the top teeth from becoming flat. 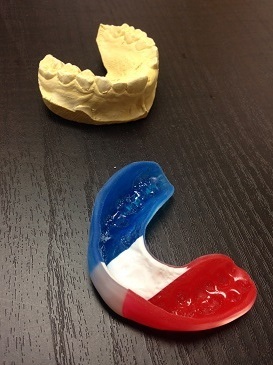 We custom fit night guards to fit the top or bottom teeth, depending on what you need and how your bite is. This dental appliance will not completely eliminate teeth grinding, but it will dramatically reduce damage to your teeth, helping it to maintain its integrity and function. You may also find that the appliance stops the rubbing pressure, which may help in reducing your headaches. In addition, the people in your household will be able to sleep more soundly as well. 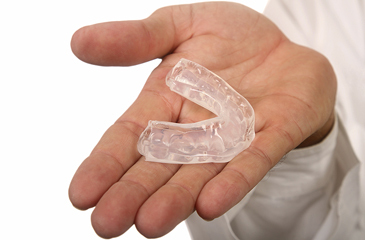 The serious athlete or casual sports enthusiast who wishes to protect his or her teeth may want to have their mouths fitted for a mouth guard. This dental appliance is custom made, and uses soft and hard materials.